ONE OF THE SOUTH'S FINEST PARKS! Easy On/Off from I-75 (exit 222) - Just 30 minutes from Downtown Atlanta & near many of Georgia's most popular attractions. After sightseeing, relax by the pool and enjoy our amenities. A Fun & Friendly place to stay. An OK place to park when visiting Atlanta. Sites are generally ok, mostly flat with average roominess. Some sites are roomier than others, some are flatter, just an average campground. I wouldn't consider it a resort just because there's a pool. This is a large park with easy access off of I-75 so there is some road noise.. The roads into the park as well as inside the park are easy to navigate. They have around 150 sites as well as cabins. There is a pool and a fishing pond. Check in was fast and friendly. We were in Site A3, a gravel pull through that was plenty long enough for our 37-foot Class A, tow-dolly and parking the car. It was very narrow and no picnic table. WiFi was spotty and our Verizon signal was strong. We stayed January 10, 2017 and paid $36.00 a night with our Good Sam discount. Nice park. Close to Interstate though. Hear Interstate in the front of the campground. Spaces are close together. this park looks nothing like the pictures. when you first pull in, the office and pool area looks good. all the staff were very nice. it goes down hill quickly when you enter the camping area and the further in you go the worst it gets. no way would I stay here again. The office building looks great and is fresh. The pictures posted on the internet are very deceiving. If you like dirt and dust and if you like closeness and tight spaces then this is the park for you. The price is good but park is un kept. Stayed over night while travelling north. People are friendly and helpful. Interior roads are good,had a pull thru that was level, with good hook ups. Sites are narrow and park is crowded with many seasonal or full time residents. Price is very reasonable and would stay here again. Did not enjoy our stay. Rundown appearance. Overwhelming number of other campers were transient types with old pick-up labeled roof repair, painting, driveway resurfacing. Looked like a Gypsy camp. Beautiful office and clubhouse, very rundown everywhere else. Will not be back. This park is gravel and mud, with few black top roads. When it rains it floods on some sites, our picnic table seat was completely under water, right next to the coach. The office/store/community center is nice, but the rest of the park needs a lot of work. If you are headed northbound from I75, be aware that you will need to make two left turns. One is at the end of the exit ramp and the other is just past the enterance ramp to southbound I75. Just past the closed gas station. Signage is poor and our gps did not have us in the correct lane. You can turn a big rig around past and behind the shopping center if you are talented at driving. However I would suggest watching to the left for the tiny sign. Entrance road says no outlet but there is if you go all the way to the campground. The camp sites are narrow and short. Only a few big rig friendly slots so make reservations. Many guests are long term but the place is not rundown, just older. Bath house was clean and modern. Ideal park for trailers or smaller RV. Good value for price close enough to tour Atlanta. We travel in a big RV. This camping area isn't anything like the pictures. Good for an overnight. Spots are very close together. No room to open canopy. 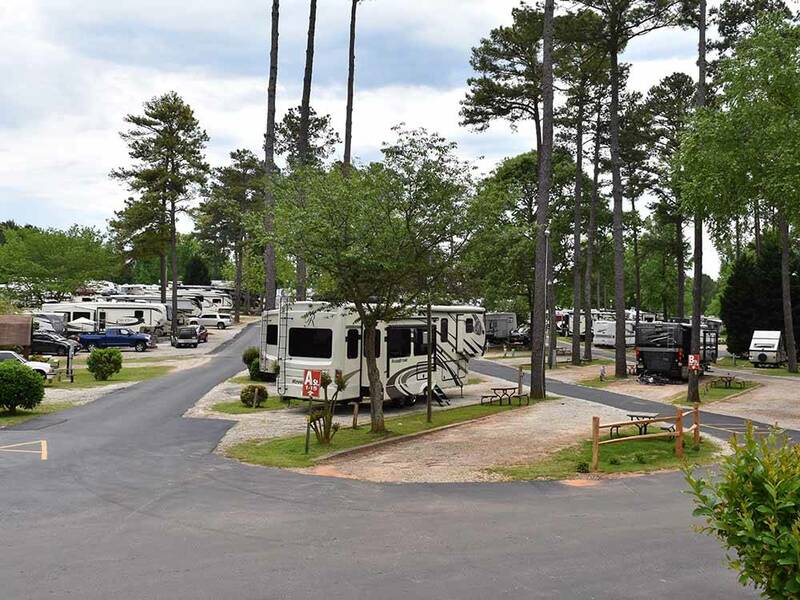 This location would be strictly for RVers that need a quick overnight that is right off 75. The sites are gravel and the streets are broken up . There is absolutely no cable. When I asked the office staff they said I should be able to pick up reception with my antenna - that was not happening!!! The check in building was beautiful and the staff was friendly but this place really needs some upgrading. I would not stay here again. Very crowded, lots of extended stay campers, tractor trailers were driving through campground at all hours and not respecting speed limits. Apparently they offer storage or parking for tractor trailers. Would not recommend.